When they heard [what Jesus said about Elijah's ministering to foreigners], the people in the synagogue were furious. Jumping up, they mobbed him and forced him to the edge of the hill on which the town was built. They intended to push him over the cliff, but he passed right through the crowd and went on his way. 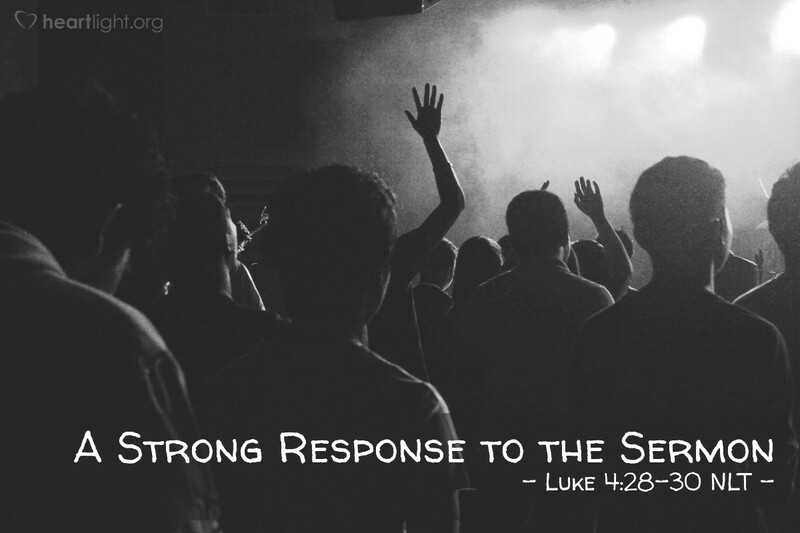 In some church cultures, after a message is given, an invitation is offered for people to respond to that message. Well, Jesus got a response to his message in the synagogue, that's for sure. The people were furious. Their response is a reminder to us that not all truth will be well received. Sometimes the truth of God provokes deep anger, especially among those whose faith is couched in prejudice and a false sense of ethnic or religious superiority. When prejudice is displayed by those claiming to be God's people, the presence of Jesus leaves those people and moves to people who will share his grace. We must eradicate from our midst all racial and cultural hatred and any sense of ethnic or religious superiority. God's people must realize that it is by grace that we are saved. That grace should move us to share God's love with others with gentleness and respect, regardless of how similar to us or different from us they may appear to be. Open our eyes, dear God, so that we may see that the fields are white to harvest, even in this time of rancor and hatred in our world. Use me, use us your people, to be your tools of grace to break down barriers that divide races, cultures, people, and nations so that when we worship you together in heaven, it will not be the first time we have worshiped in joyous diversity and multi-cultural praise. In Jesus' name, I pray. Amen.